Arctic Adventure is an early Apogee game designed by George Broussard. The game is similar to Monument of Mars and Pharaoh's Tomb: an exploratory game that combines elements from different genres. 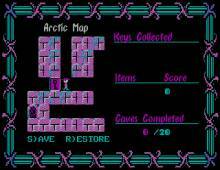 In the game, you have to collect pick axes to destroy ice, keys to unlock doors, and avoid monsters. Similar to later action games from Apogee, except much more simplistic. You view the action from the bird's eye view, and the graphics are adequate given the 4-color limitation of CGA. A nice little game with devious level design that already shows Apogee's knack at making fun, unassuming cross-genre shareware titles that can stand with the best of commercial games. Thumbs up!